A new musical for the entire family. "A Chorus Line" for Kids. 4. That's What Kids Do! 13. Give Us A Chance! 15. I Don't Think So! That's What Kids Do! is a funny and uplifting new musical for the entire family written by award-winning composer Cathy Block and featuring The Living Green Children's Chorus. That's What Kids Do! is the first release for The Living Green Childrens Chorus, but not for Cathy. Cathy's album of original music for children, Timeless (on imi records), was given the Editor's Choice Award for children's best audio by The American Library Association Book List. Timeless also garnered The Oppenheim Toy Portfolio Platinum Award for best audio. Recording artists including Diana Ross, Kool & The Gang, Al Jarreau, New Edition, Myleka and Tisha Campbell have recorded her songs. Her song Never Explain Love, performed by Al Jarreau, was featured as the closing credit song in the Spike Lee motion picture, Do The Right Thing. At last, a musical about elementary school! …. This collection of 14 songs (and linking dialogue) offers a humorous tour of the institution and its effect on students. Songs deal with first-day jitters, boy-girl tensions, lonely preschool siblings, twin scourges of homework and cafeteria food, and student longings for home and vacation time. The young singers and accompanying band make this a listening pleasure. 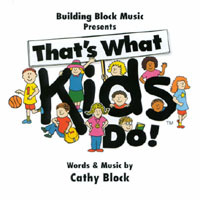 Cathy Block's album is a studio cast recording of the show That's What Kids Do! As the cast members share both their excitement and anxiety about the beginning of the school year, listeners identify with the feelings and emotions portrayed in each song….A variety of musical styles are utilized, from blues to full chorus line numbers…Upbeat, empowering and fun, this CD will be welcome for back to school units, and will be enjoyed by patrons just looking for a good kids’ musical.